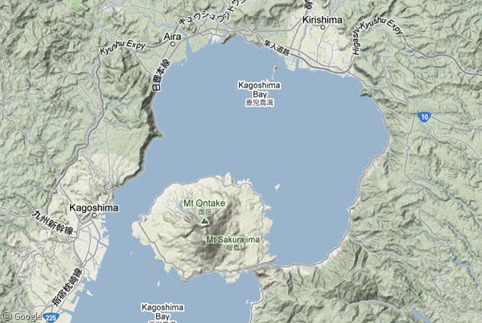 Once a volcanic island centered in Japan’s Kagoshima Bay, during an eruption in 1914 the Sakura-jima volcano decided to change the landscape by reaching out with massive lava flows and connecting itself to the mainland. The lava also engulfed several smaller islands around the volcano and altered the tides by raising the bay’s floor. Sakura-jima is a 1,117 m (3,665 ft) tall stratovolcano that formed in the centre of the 22,000 year old Aira caldera in southwest Japan. 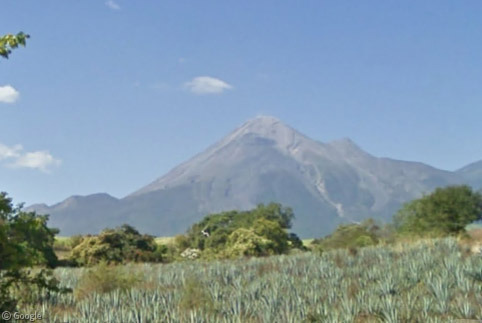 It is considered one of Japan’s most active volcanoes due to thousands of small eruptions that occur here each year. In 1914, Sakura-jima exploded in a massive eruption that dumped layers of deep ash around the region. 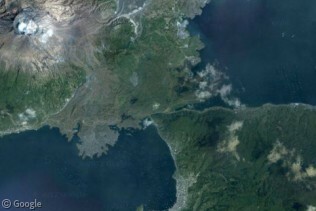 Large lava flows from the eruption actually connected the east side of the island to the Osumi Peninsula. The ash blanket covered the adjacent city of Kagoshima, but the city quickly recovered and these days prepares itself by holding regular evacuation drills. Google’s satellite imagery of Sakura-jima is quite impressive and clear, allowing us to see great detail in the terrain moving down the hardened lava flows and at the caldera itself. Most of the lava flows occured on the east side of the island, and you can see from the imagery that aside from the coast, the east side is very desolate. 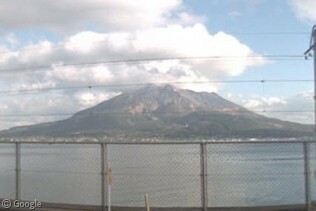 The west side of the island however has a few towns, and across the bay is the city of Kagoshima. 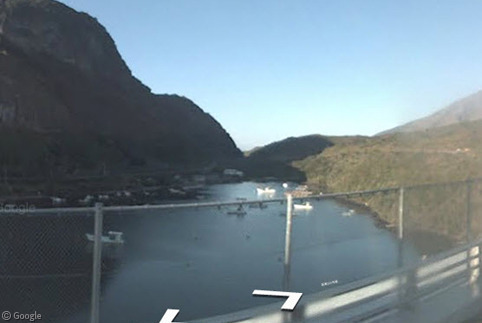 The Street View car also visited Kagoshima and Sakura-jima, and while it didn’t get very close to the caldera itself, we do get to see some great views of Sakura-jima itself from both Kagoshima and from the island. 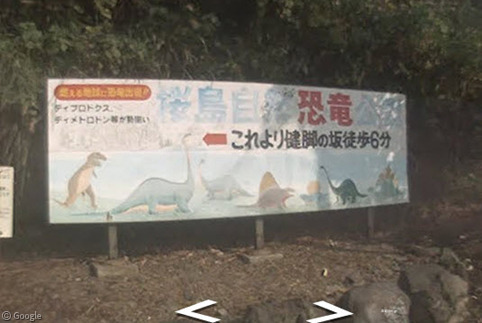 The land-bridge that was formed from the 1914 eruption has now been covered in roads, and thanks to our Street View driver we can get a neat glimpse at one of Earth’s newest landscapes. 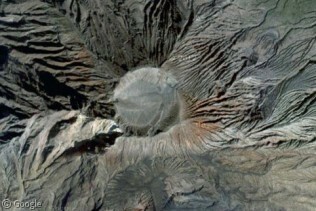 Sakura-jima’s last significant eruption was in 2009, but fortunately no significant damage was reported. 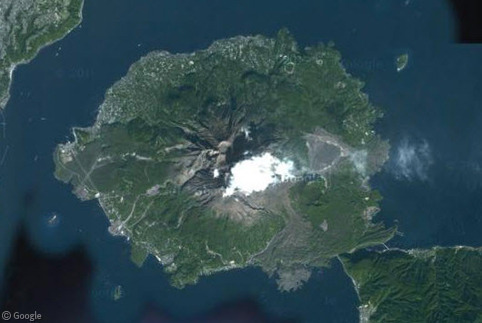 However, scientists at the Sakurajima Volcano Observatory (that was set up in 1960 to monitor the area) insist that Sakura-jima is still very active indeed.